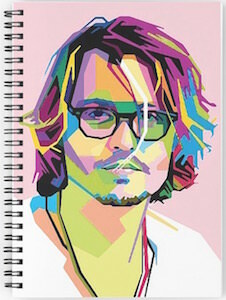 If you like Johnny Depp then this notebook is what you want as it shows a fun colorful portrait of the actor on the front. The spiral bound notebook is is 8.5 x 6 inch and has 120 pages and you can choose between lined or graph paper. The front cover of the notebook has a pink background with on that a portrait of Johnny Depp made of all kind of colors but still wearing black glasses and a white t-shirt. It’s just a great looking notebook that you can use almost anywhere. Grocery lists at home or for writing notes at school or work the options are limited only by yourself.